The first leg of the Europa League quarter finals was on today. Benfica, Chelsea & Fenerbahce played at home and defeated Newcastle United, Rubin Kazan & Lazio respectively. Tottenham Hotspurs could not grab a win at home and drew with Basel 2-2. A brief look at the matches below. Benefica defeated Newcastle United coming from behind to secure a 2 goal lead. Having the valuable away goal Newcastle still have a slim chance of reversing the results next week at home. Question to the readers: Newcastle manager Alan Pardew had suggested that Benfica were not as good as the best teams in the premier league – Benfica proved their point to him today. What do you think will be the result of the second leg? Fernando Torres finds his goal scoring quality to score twice against the Russian team. Holding onto the healthy lead Rafa Benitez’s side will be travelling to Moscow next week to play the second leg. Benitez commented that he was happy but not 100 per cent as his team had conceded a goal when they were in control of the game. His post match comments paraphrased. Question to the readers: A reporter, after the match, lightly asked Rafael Benitez if Torres should stick with the mask until the end of the season. Do you think Torres has returned to form and will he maintain the class he displayed against the Russians today? Fenerbahce made sure they utilised the advantage of Lazio going down to 10 men. Webo’s 79′ penalty and Kuyt’s 90′ goal secured their victory ahead of the second leg at Rome. Question to our readers: Do you think the Turkish team will be able to hold on to the lead past the second leg to make their first appearance in the Europa League Semi Finals. The Spurs came from two goals behind to finish on a draw during the first leg against a fantastic FC Basel. For the Spurs fanatics it was a tough to see their team down 2-0 with Basel scoring two away goals before half time. Much to their reilef the goals from Adebayor and Sigurdsson evened things before the final whistle. To add to their misery Gareth Bale had to be taken away on a stretcher after rolling on his right ankle after a tussel for the ball with David Degen. Though it looked horribly worn on TV and pictures Villas-Boas revealed the initial diagnosis was positive. He will be undergoing scans for a definite answer. Question to our readers: Basel already has the valuable 2 away goals and on top of that Bale’s ankle injury – is this the end for tottenham’s Europa dream this year? Or will the spurs reverse the score next week? Cristiano Ronaldo, Karim Benzema and Gonzalo Higuain led Real Madrid to a 3 nil victory at home. Galatasaray’s defence was not organised enough to contain the Spaniard’s counter attack. Scoring his 18th goal from 16 UEFA appearances Cristiano Ronaldo opened the account for goals just 9 minutes into the game. Benzema doubled the score line at 29′ and Higuain headed in the third one after half time. Real Madrid will be playing at Turkey next week without Captain Sergio Ramos. Holding the Bundesliga champions to a draw Malaga have not let their championship dream die out in the first leg. However the return leg will be interesting as they will be without Weligton and Manuel Iturra for the second leg. Borissia Dortmund, on the other hand, were unable to capitalise on numerous occasions. The first half was full of opportunities for the German shirts to convert for a healthy advantage in the scoreline. Mario Gotze had three golden openings to get past Willy Caballero at La Rosaleda but the Germans left empty handed. Malaga will have another opportunity to to prove their presence next week in Germany. Lets look at some of the match stats. “We missed a few good chances but we’re in a better position than we were at 2-1 and there is no reason why we can’t go there and get a result.” David Beckham commented after his team drew with Barcelona after Blaise Matuidi’s 94th minute goal. Lionel Messi scored the first goal putting the Catalan club ahead at 38 minutes but had to be substituted shortly after due to a hamstring problem. Unfortunate for Barcelona fans the quick footed Argentinian might not be appearing for the second leg at Camp Nou as a result. Zlatan Ibrahimovic, albeit offside, equalized in the 79th minute. He pounced on the free ball after Thiago Silva’s attempt was rejected by the post. At 89 minutes Tito Valentino would have thought they secured the game when Xavi Hernandez scored on a penalty but the French continued fighting to find the equalizer at 94 mins. The 18 game winning streak for Juventus was broken today. Bayern’s attempt to reach the third Champions League finals in four years seems to be on track defeating Juventus on the first leg of the Champions League Quarter finals. The Bavarian club secured a 2 goal win against Juventus at Fußball Arena München (Allianz arena) today. David Alaba scored the first goal 25.02 seconds into the match making this the seventh fastest goal in UEFA Champions League history. Thomas Muller scored the second just after the first hour to secure the lead. Juventus: Gianluigi Buffon, Giorgio Chiellini, Andrea Barzagli, Leonardo Bonucci, Arturo Vidal, Andrea Pirlo, Federico Peluso substituted for Paul Pogba, Stephan Lichtsteiner, Claudio Marchisio, Fabio Quagliarella-substituted for Sebastian Giovinco, Alessandro Matri-substituted for Mirko Vucinic. With the quarter final stage approaching lets have a brief look at the 8 teams appearing on this leg of the championship. First time qualifiers to Champions league Málaga Club de Fútbol are a Spanish football team from Malaga, Spain. Having defeated FC Porto in the round of 16 they will be playing Borussia Dortmund for a place in the semi-finals. Interesting fact: Cash strapped Malaga have been banned from the Champions League and all other UEFA competitions for the next season they qualify in the next four years and will get another year’s ban if they can’t clear any outstanding payments to clubs, players and tax authorities by March 13, 2013. The current German Bundesliga title holders Borussia Dortmund are making their 12th appearance in the UEFA champions league. The 11th biggest football club are looking to repeat 1996/1997 history and bag the title. Interesting fact: Borussia Dortmund were recently fined $25,550 (€20,000) for fan trouble during two Bundesliga games. Dortmund fans threw lighters and other objects onto the pitch in the league game against regional rivals Schalke & goalkeeper Lars Unnerstall was hit in the back by a coin. On the second game fans threw paper rolls onto the goal of the visiting team forcing the referee to briefly stop play. Interesting fact: The Real Madrid coach, José Mourinho, was once given a two-match ban for poking Barcelona’s assistant coach in the eye during one of the Spanish Super Cup games. Television cameras caught Mourinho poking a finger into Vilanova’s eye during a scuffle between the two teams at the Super Cup second leg on 17 August. The 18 time Turkish Super Lig title winners are making their 21st appearance in the UEFA champions league. They are the most successful Turkish football club with numerous Domestic titles. Interesting fact: Galatasaray fans broke the “loudest crowd roar at a sport stadium” record on 18 March 2011 at Galatasaray’s stadium Türk Telekom Arena in Istanbul. A reading of 131.76 dBA was recorded. To give you an example of 130 Db it is the sound you would hear from a jet plane 100 ft away. PSG, one of only two French clubs to have won a major European trophy, are appearing for the 6th time in the UEFA champions league. PSG has been playing in the Ligue 1 since 1974 and is one of the most prestigious clubs in French football. They have won two League titles, eight French Cups, three League Cups and two Trophées des Champions. Interesting fact: One million fans have applied for tickets to watch the Champions league quarter finals on 2nd April at Parc des Princes. Unfortunate for the fans the stadium only accommodates 45000 seats out of which 25000 are owned by season pass holders and 5000 reserved for Barcelona fans and UEFA officials. The club has revealed that fans bombarded the phone lines at the rate of 100 calls per second. The current Copa del Rey champions who have also won 21 La Liga, 26 Copa del Rey, 10 Supercopa de España, 3 Copa Eva Duarte and 2 Copa de la Liga trophies are making their 23rd Champions league appearance. Barcelona is also the only European club to have played continental football every season since 1955, and one of three clubs never to have been relegated from La Liga, along with Athletic Bilbao and previously mentioned Real Madrid. Interesting fact: Barcelona ended their 111 year old tradition on not having a sponsor on their shirt for a record setting 125 million pound deal with the Qatar foundation in 2010. Up until then barcelona did not have any paid sponsors on their shirt. Biggest revenue football club in Germany, Bayer Munich, are making their 29th UEFA Champions league appearance. The most successful team in the Bundesliga, Bayern, is also one of the only three clubs to have won all three major European competitions and also the last club to have won the European Cup three times in a row entitling them to wear a multiple winner badge during Champions League matches. Interesting fact: From 1994 to 1996 during the leadership of coaches Giovanni Trapattoni and Otto Rehhagel Bayern finished trophy-less.During this time Bayern earned the nickname FC Hollywood as players started to appeared in the gossip pages of the press rather than the sports pages. Current and 28 time Serie A champions are making their 37th Champions league appearance. Officially winning over 53 titles in national and international stages Juventus have earned respect as the most successful Italian club. They are the only club in history to have won all possible official continental competitions and the FIFA club world cup title. Interesting fact: Juventus was one of the five clubs linked to a Serie A match fixing scandal, the result of which saw the club relegated to Serie B for the first time in its history. The club was also stripped of the two titles won under coach at the time Fabio Capello in 2005 and 2006. 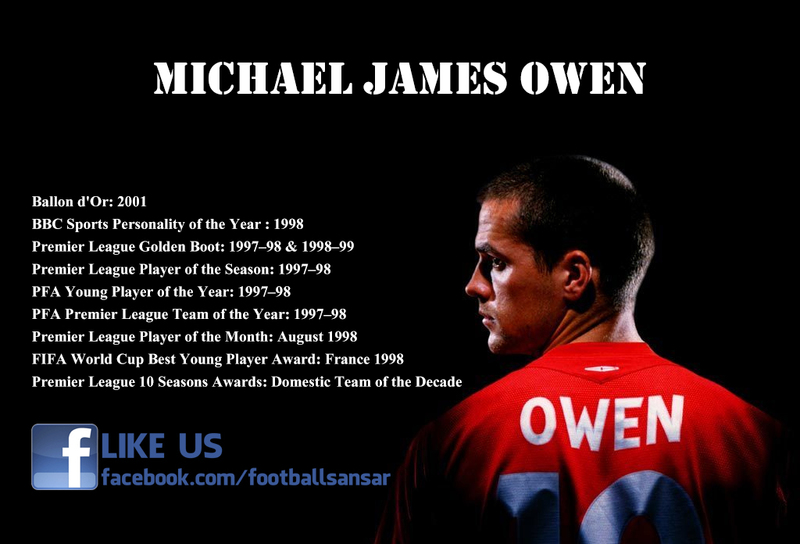 All good things come to an end and so has Michael Owen’s professional football career. Owen announced that the current season at Stoke City will be his last. “Big day today. I have decided that this will be my last season as a professional footballer.” Owen tweeted. Lets take a walk down memory lane and remember the legend’s moments with the game. Debuting with Liverpool at just 17 Owen played with many other star clubs in his career – Real Madrid, Newcastle United, Manchester United and finally the club he is retiring from Stoke City. He scored 179 goals in 306 appearances for Liverpool and 40 goals for his country from 89 appearances. Any fan of Michael Owen will remember his fantastic goal against Argentina during the 1998 World Cup – Owen believes this goal changed his life. He received the FIFA World Cup Best young player award and was coined ‘BBC Sports Personality of the Year’ that year. Besides this he has received various recognitions in his club career- 2 x Premier League Golden Boot, Premier League Player of the Season just to name a few. Though he leaves football professionally he has already left his mark in the game. A legend we will all remember. I’ll leave you with some quotes form his personal website about his retirement. “It is with an immense amount of pride that I am announcing my intention to retire from Professional Football at the end of this season. Having progressed through the ranks at Liverpool to make my first team debut at 17, before embarking upon spells at Real Madrid, Newcastle United, Manchester United and Stoke City, not to mention representing my country on 89 occasions, I now feel it is the right time to bring the curtain down on my career.